These pages will help you find your way around inside there and clue you in to what type of measurements you need to do. 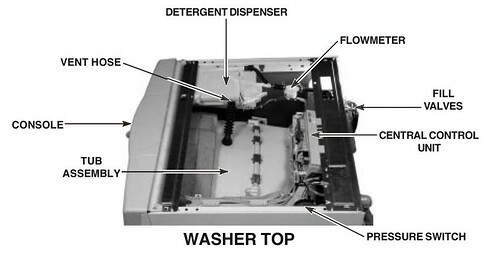 BTW, the service manual for this washer is the best $25 you’ll ever spend; come git you one. Once you figger out what’s wrong, the Samurai recommends that you buy the parts you need ratcheer. You’ll get ’em fast and you can return any part for any reason. This entry was posted in Washer Repair on June 4, 2007 by Samurai Appliance Repair Man.